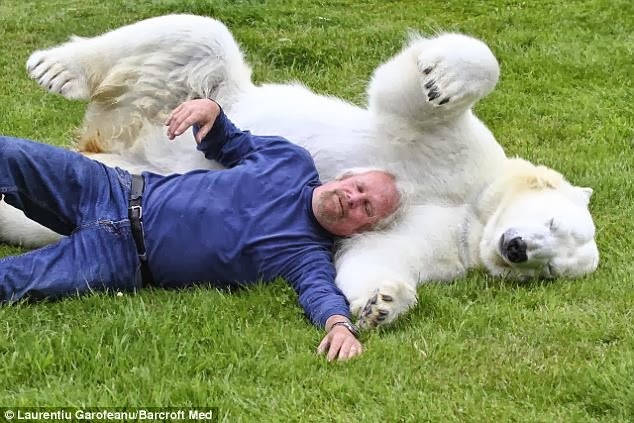 Grizzly man Mark Dumas, 60 and wife Dawn, 49, is the only man in the world who can touch a polar bear and the only man in the world that can swim with a polar bear. 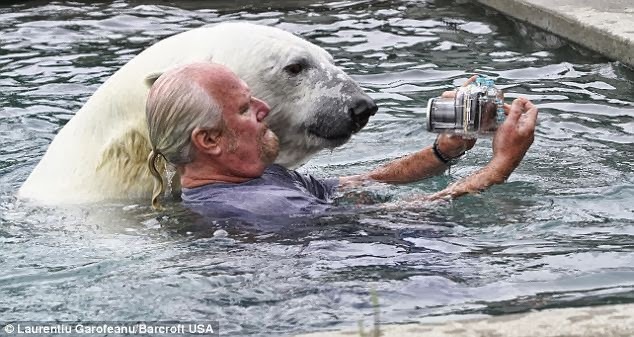 And as these incredible pictures show Grizzly Man, the fearless polar bear handler from Abbotsford, British Columbia, even goes for dip in his swimming pool where he and 16-year-old polar bear Agee enjoy a watery cuddle together. Agee the polar bear has even performed in movies like 'Alaska' in 1995 when she was just a few weeks old. 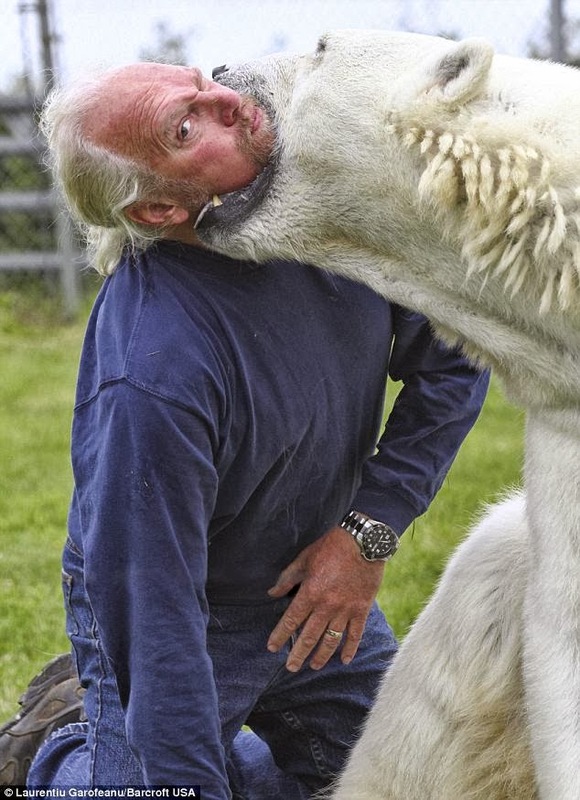 With his incredibly intimate bond Grizzly Man Mark Dumas wrestles on the grass with polar bear Agee, kisses her, puts his head in the polar bear's huge jaws, and even bear hugs her as she rears up on her hind legs to over seven feet. Mark and Dawn have owned Agee since she was six weeks old and the colossal polar bear even lived in their home as a cub where she played with the family dogs and was bottle fed. "If anyone else tried this they would end up as Agee's dinner," said Mark. "The only people in the whole world she likes are me and my wife. I have worked with bears in this way for over 40 years, so I can read Agee's body language and know how to behave safely around her. Agee has rules and we are always working inside those." "She loves her work," said Mark. "They are extremely intelligent animals and you can see she gets enjoyment out of being stimulated through her work. She could never have lived wild so it's important to us that we keep her active and thinking. That's why I like swimming with her and playing on the lawn. In the evenings Agee is fed on mountains of protein-rich salmon, chicken or other meats, along with carbohydrates she gets from high-quality dog food and vitamin supplements. In the wild she would be eating seal but we can't buy that so we have to try and replicate a fat-rich diet," said Mark. Because they scavenge in the summer - when they are off the sea ice and on dry land - they have very adaptable diets. Amazingly, Agee seems to have favourites between men and women. "She gets very jealous of other women talking to Mark," said Dawn. She's happy with me doing it but if any other women are around she gets very possessive of him." "She lived inside our home for the first few weeks and we hand-reared her," said Mark. "Eventually a time came when she was so big we had to move her outside into her own enclosure. Now Agee spends her time living in her new enclosure on rented land near Mark and Dawn's home in Abbotsford, and on the road working on TV and film sets. At home, Mark enjoys 'play time' with her. Earlier in the morning she's more playful and relaxed and she lets me roll around with her. We wrestle for fun and sometimes we fall asleep on her grassy lawn together. It's a great way to unwind after a bad day"
That Is So Awesome: Siberian Husky Having All Kinds Of Fall FUN! Bears are canine, so I suppose it makes some sense to see them act like one. But, and it is a very big 'but', you would never catch me doing what this chap does. I just cannot decide whether it is brave, foolhardy, or perhaps both! Until he makes a wrong move and grizzly hurts him or kills him and then they kill the poor grizzly for simply being a bear and doing what bears do. If he really loves the bear he should let it go. It's a polar bear. Not a grizzly. Also, did you read the part where it says they hand-raised the bear from the age of 6 weeks? This bear wouldn't know what to do if it were released to its natural habitat. It needs their care to survive. Would like to see a follow-up report several months/years hence. 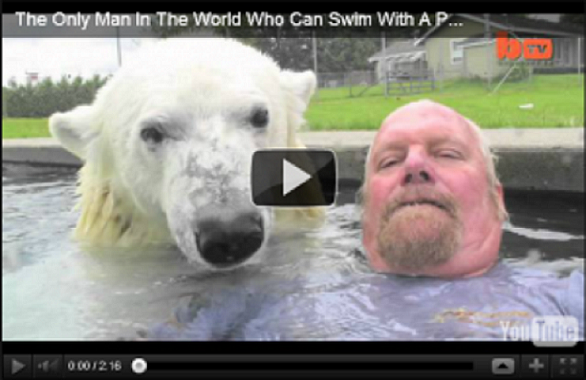 It would probably read "polar bear kills owner"! After all, she is a wild animal.